This is a post I wrote in Maverick’s blog about us winning the Agency of the Year award for the third year running. Satisfied is a word that comes to mind. But also paranoid because I’d sure like to see us retain that title for the next few years coming, as well as winning other awards. There’s just no pleasing some people. We are delighted to read the October edition of marketing communications MIX, in which Maverick was named Agency of the Year 2013 – for the third year running. Journalists were polled by the magazine and asked which PR firm they thought had the best media relations. They apparently voted for Maverick for the third year running, so although we think that PR is much, much more than just media relations and that we are more of a consultancy rather than an agency, we are still pleased by the verdict. This recognition is important to us because it means that one of our most important “customers” thinks highly of us (the other is the client, who usually vote with their check books and we’ve been fortunate in that area as well). To have journalists giving us the thumbs up on how PR people should deal with them is a rare endorsement as journalists are one hard crowd to please. 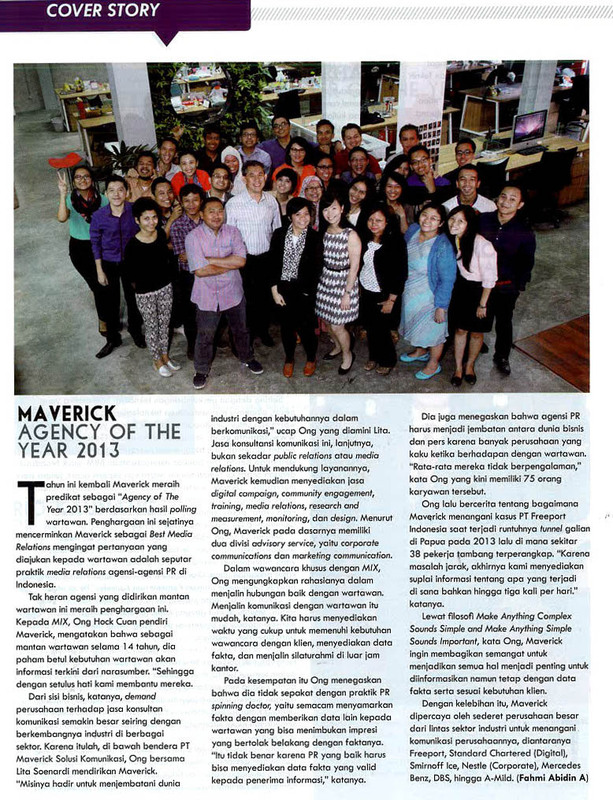 As a partner in Maverick I was interviewed by the magazine as a prelude to their announcement of the award. I was asked how Maverick could consistently be at the top of the media relations game for three years running and I told them that there was no big secret to media relations. All we had to do is adopt a customer service mentality when it comes to dealing with journalists. We need to understand what they want, when they want it and how best to give it to them. Journalists don’t want spin and they despise PR people who go to them with a begging bowl instead of a strong, newsworthy story . And they usually want the information now, or as early as possible before their deadline. So what all the Mavericks are trained to do is to work with our clients so that they have a great story to tell instead of the usual corporate pabulum that their executives are so fond of. We also, using all our skills as consultants, remind, cajole and sometimes push our clients to meet the deadlines. The tricky part is to have a team of colleagues that understand this and work relentless to super-please the journalist-customer. In this we are very fortunate to work with a great team of consultants who are probably the best customer service professionals on top of their communications and specialised skills. So a shoutout to the Mavbros and Mavchicks, as they like to call themselves, in the Corporate and Marketing Communications practices as well as the specialists in Digital, Research and Monitoring, Design, Community Engagement, Training and, of course, Media Relations. And a big thank you journalist friends for voting us Agency of the Year once again. We’ll continue to try our best in serving you together with our clients.